In its 2016 survey of construction and design companies, Modern Healthcare magazine ranked Robins & Morton second among the top general contractors in healthcare construction, based on 2016 revenues. Robins & Morton has specialized in healthcare construction for more than half of their 71-year history. Robins & Morton ranked on the list with $1.08 billion in revenue for completed construction projects in 2016. The company built more than 3.1 million square feet with 87 percent of its work in healthcare projects across 18 states. Since the inception of the Modern Healthcare Construction and Design survey in 1986, Robins & Morton has been ranked for 31 consecutive years, each year among the top seven contractors, including six number one rankings. Two notable projects that Robins & Morton completed in 2016 are Miami Cancer Institute at Baptist Health South Florida in Miami, Florida, and Hospitals of Providence Transmountain campus in El Paso, Texas. Designed to withstand a category five hurricane, the Miami Cancer Institute brings many of Baptist Health South Florida’s outpatient cancer services together under one roof to offer 305,000 square feet of world class clinical services and cutting edge technology. Its adjacent 140,000-square-foot clinical research building will accommodate an extensive clinical trials team, genomic medicine laboratory and clinical space planned for bone marrow transplant – amongst other services. 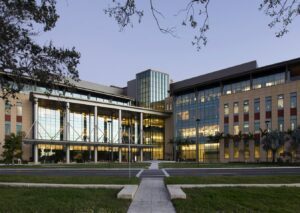 It’s housed on the Baptist Hospital campus and a 350-foot pedestrian walkway connects the Institute to Baptist Hospital. It is the only cancer center in North America to house every available treatment modality (photon and proton) under the same roof. 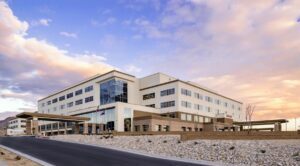 The new 311,731 square-foot, six-story Hospitals of Providence Transmountain Campus is the newest teaching hospital in the United States, located in the growing area of northwest El Paso. The full-service 106-bed community hospital began operating on January 17, 2017. Transmountain Campus has an academic affiliation agreement with Texas Tech University Health Sciences Center El Paso to serve as a primary teaching site for medical students, residents, nursing students and researchers. This collaboration will help address medical disparities in El Paso and the border region by training the next generation of physicians.